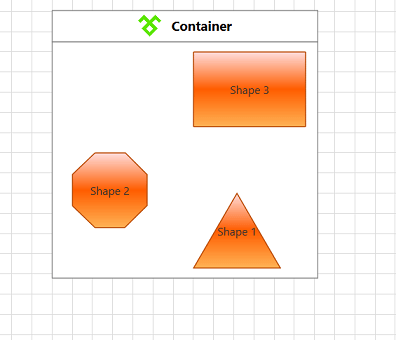 This tutorial describes how to customize the default look and feel of the RadDiagramContainerShape. 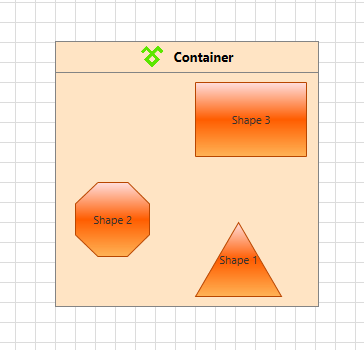 You can further customize the appearance of the RadDiagramContainerShape by editing its default style and template. In Expression Blend, add a RadDiagram control and a RadDiagramContainerShape onto it (accessible via the Assets panel). Select the container shape and in the 'Objects and Timeline' panel right-click the object or use the dropdown as shown in the picture below. Select 'Edit template > Edit a copy', this will create a copy of the default template which you can customize. After clicking 'OK', Expression Blend will generate the default style of the RadDiagramContainerShape control in the Resources section of your UserControl/application. The properties available for the style will be loaded in the 'Properties' pane and you will be able to modify their default values. If you want to change the ControlTemplate elements of the RadDiagramContainerShape select the style in the 'Objects and Timeline' pane, right-click on it and choose Edit Template -> Edit Current. 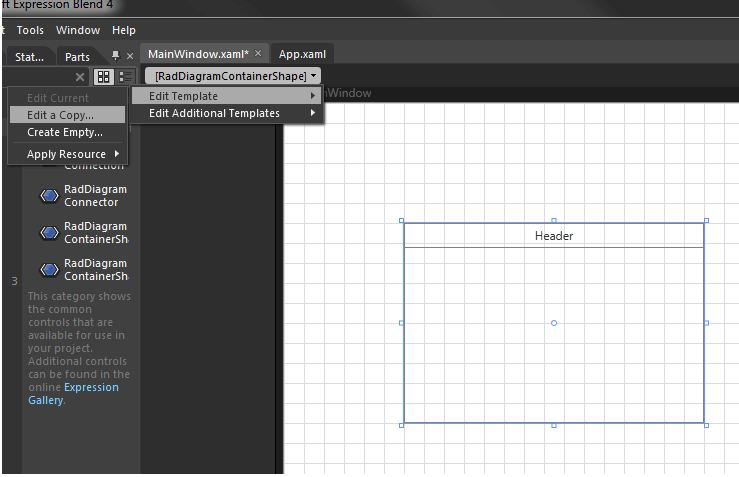 In the same pane the element parts for the RadDiagramContainerShape's template will get loaded. The various things which apply to ControlTemplates in general and customization of RadDiagram shapes in particular apply to the RadDiagramContainerShape as well. This means that you can modify the ControlTemplate elements definitions to better fit your requirements.